Ferrari supercars have long been a source of inspiration for many artists. These fabulous luxury cars are hot, powerful, exciting, and incredibly beautiful, so it is not surprising that they frequently appear in many paintings and drawings, not to mention sculptures and other works of art by artists from all over the world. For example, last year, Fine Art Shippers was happy to take part in the Ferrari’s 70th Anniversary, helping a well-known New York-based urban artist Mitchell Schorr move and install a whole collection of his Ferrari-inspired works at Rockefeller Center. Overall, this memorable celebration marking the 70th anniversary of the legendary Italian carmaker was full of art in all its many forms, from a breathtaking open-air exhibition of the most important Ferrari supercars, entitled “Through The Decades,” to a gorgeous art installation by Mitchell Schorr, featuring paintings and sculptures by this prominent street artist. It was an amazing experience for Fine Art Shippers and definitely an unforgettable event for all Ferrari fans. Among other contemporary artists who draw their inspiration from the superb Ferrari supercars are a great German visual artist Gerhard Richter, a British artist Paul Smith, and a Polish artist Przemek Wiecek. Each of them creates truly unique pieces of art, showcasing the beauty of the Prancing Horse in different techniques and mediums. 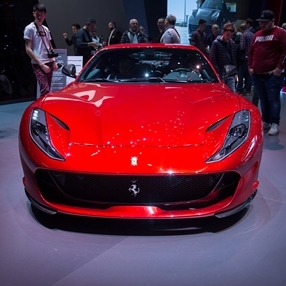 However, while there are many paintings and sculptures inspired by Ferrari, it is impossible not to mention that all luxury cars produced by this reputable Italian carmaker are also masterpieces of art. The only problem is that to own such an artwork is an expensive pleasure. Most of these cars cost millions of dollars each, though you can always look for something more “affordable” and pay only several hundreds of thousands of dollars for the legendary supercar.